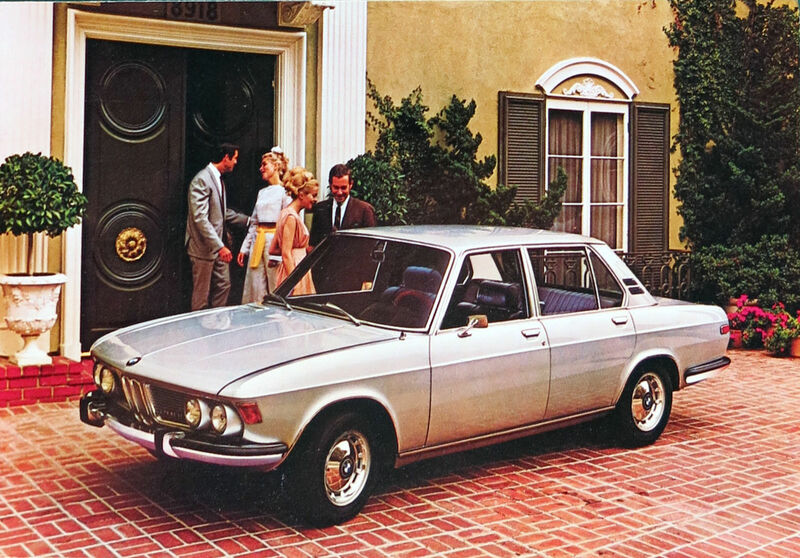 I’ve purchased a 1970 BMW coupe in reasonably good condition that I’m going to fix up. I’d like to do a full restoration, but that would require taking it all apart and add a lot of work, and I don’t have the resources for that. I’ve done that with a 1954 VW beetle, and I know what it takes to do it right. For now, I’m looking to get it in good running shape and make a daily driver out of it. 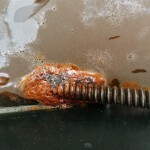 The E-9 bodies have a great number of places they rust and this one does have some serious issues, but fortunately, the front suffered a collision a while back and the entire front clip has been replaced. 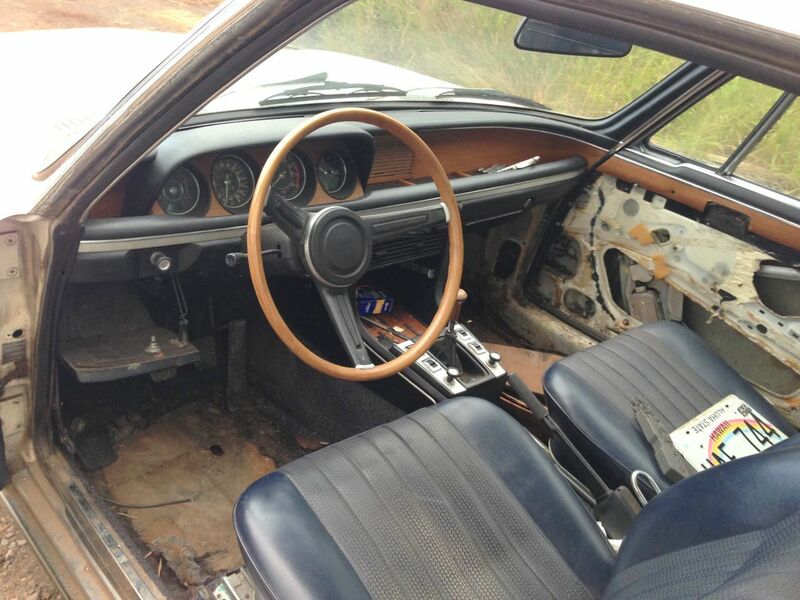 However, the rockers and doors are suffering from rust as is the right front passenger floor. 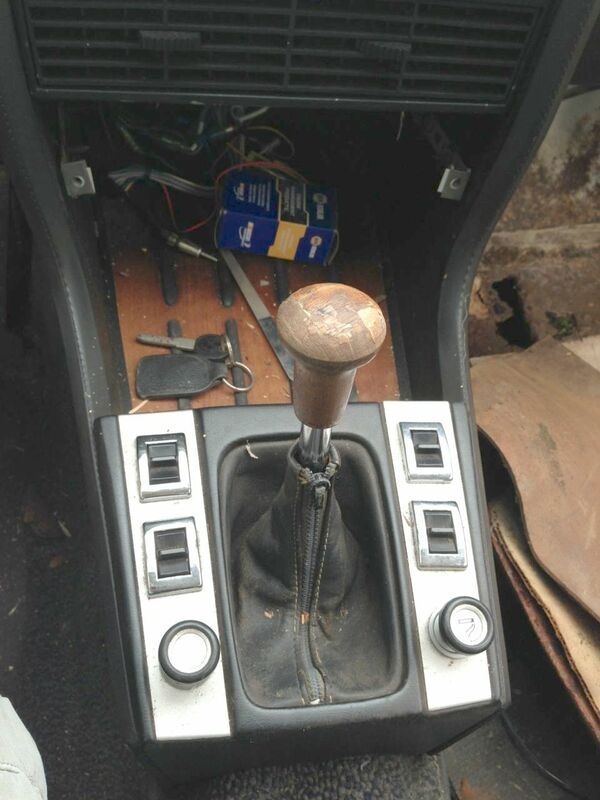 It has it’s original M30 engine and the interior is, other than the carpet, in excellent shape. It has a number of issues, a leaky exhaust system, a gas smell in the trunk, soft and failing motor mounts, the upper front strut bearings need to be replaced, and the right front brake seems to grab a bit. The mechanics will be simple to take care of. 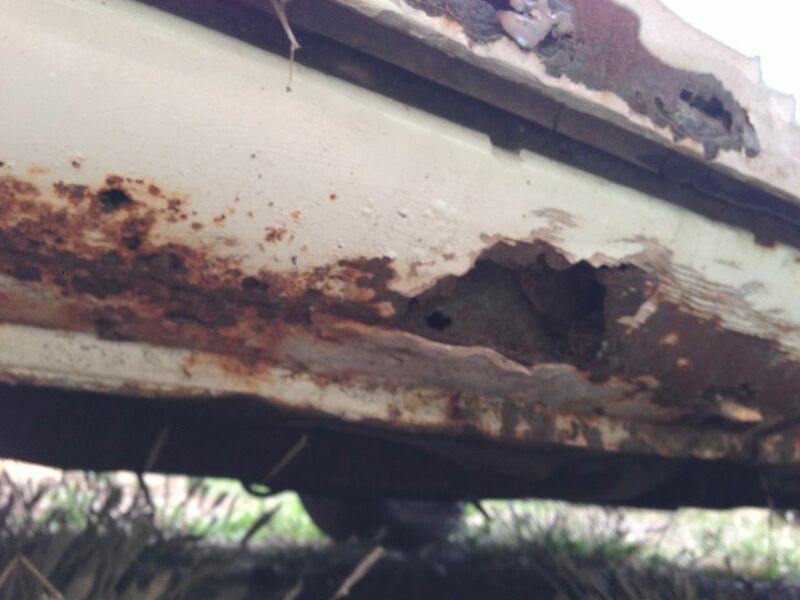 The rust is difficult and will require replacement of several body panels. 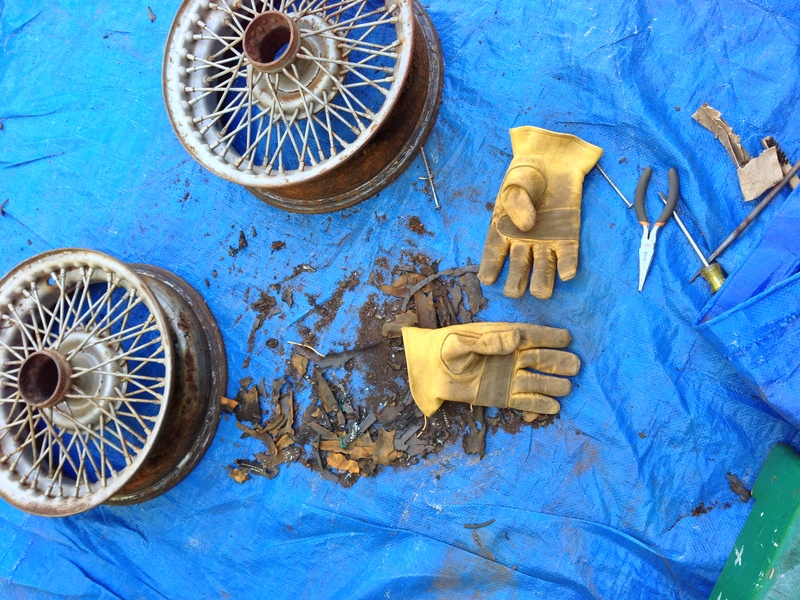 The window frames, both front and rear are rusted under the rubber, so the windows will come out. I’ll have to be very careful not to break the glass. Rubber is still available, I believe. 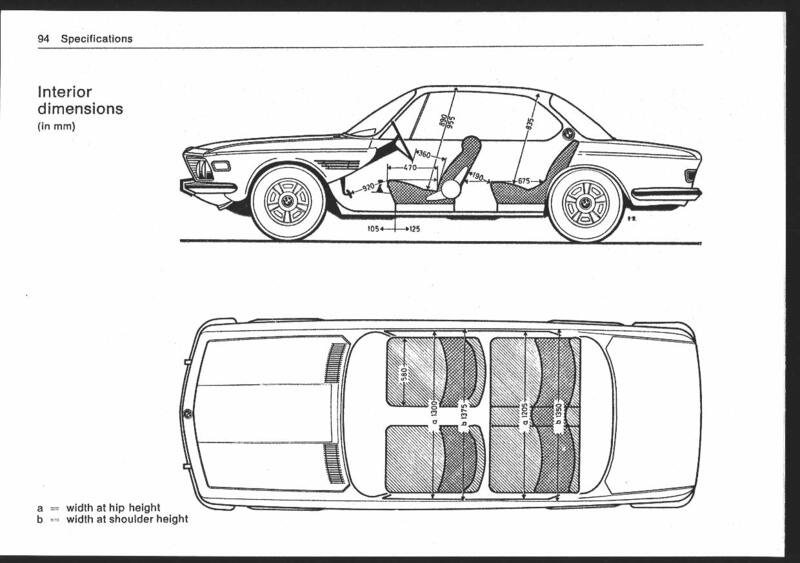 However, many parts for this car are no longer available. There are some sources for body panels, but as the panels I need to replace are not large or critical, I will be reproducing them myself. 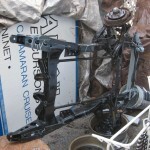 I have spent the money I would have spent on reproduction body panels and purchased shop tools instead. 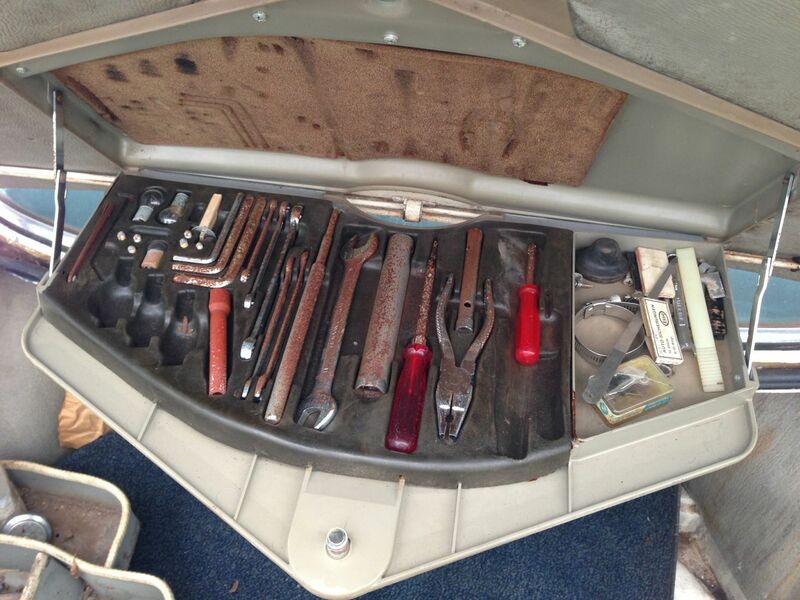 A TIG welder, bead roller and other metal forming tools. The car wasn’t running well when I bought it, part of the reason I got it for less than market value, and had been sitting for 3 years. I have gotten it running pretty well after disassembling the carbs, welding a hole in the gas tank and coating the inside with sealer and replacing the points with electronic ones which cured the intermittant firing issue it had. 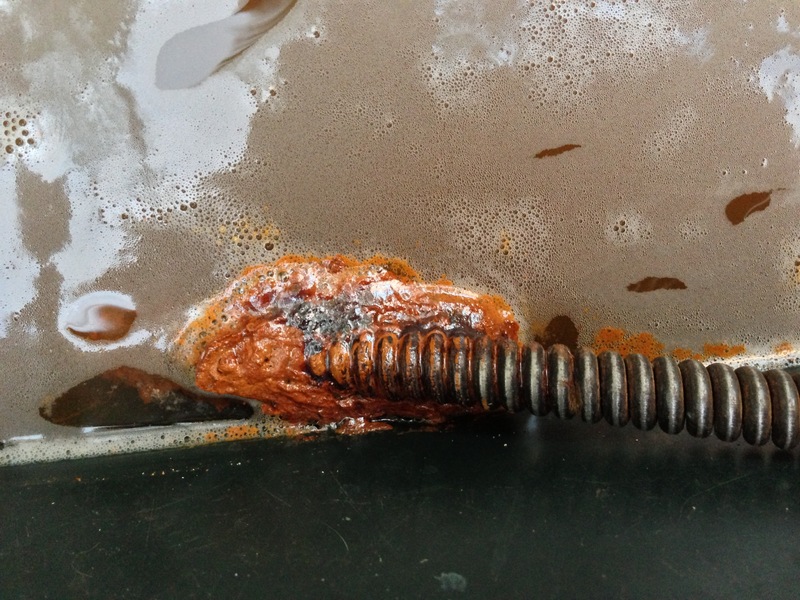 The rust is the other reason it was sold at a reduced price but this is something that I have experience with, having restored a 1954 VW Beetle with similar rust-through issues. This won’t be an easy project, due to the way the body was constructed, but it’s very doable, so I invite you to follow along. I should be making good progress in the next few months and hope for it to be back on the road before the end of 2015. 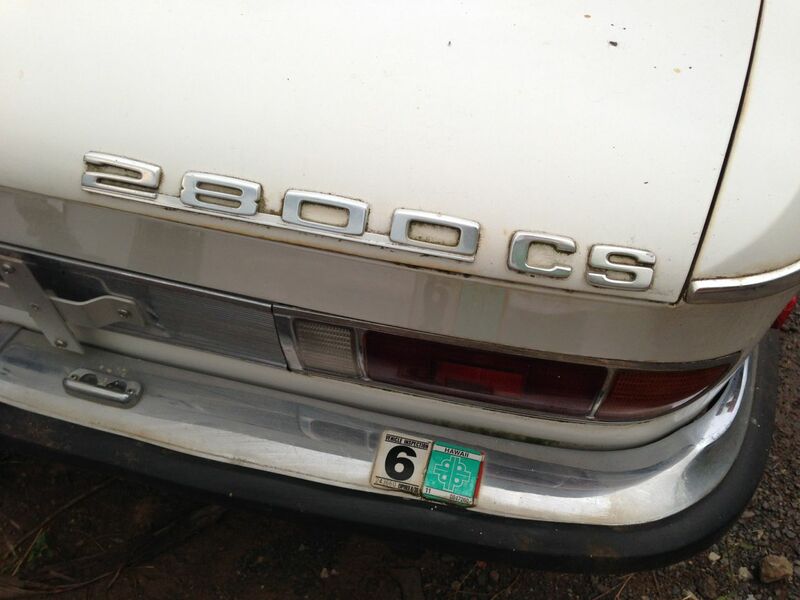 I purchased this 2800CS Sport Coupe on the island of Maui. 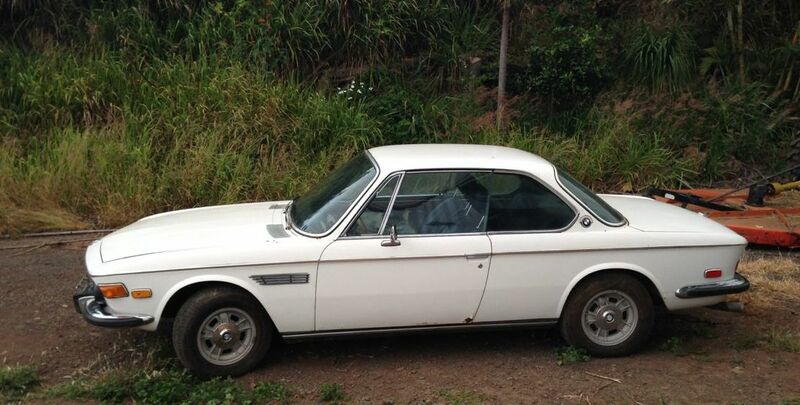 It’s owner had bought it, sight unseen, from sellers on the Big Island of Hawaii. 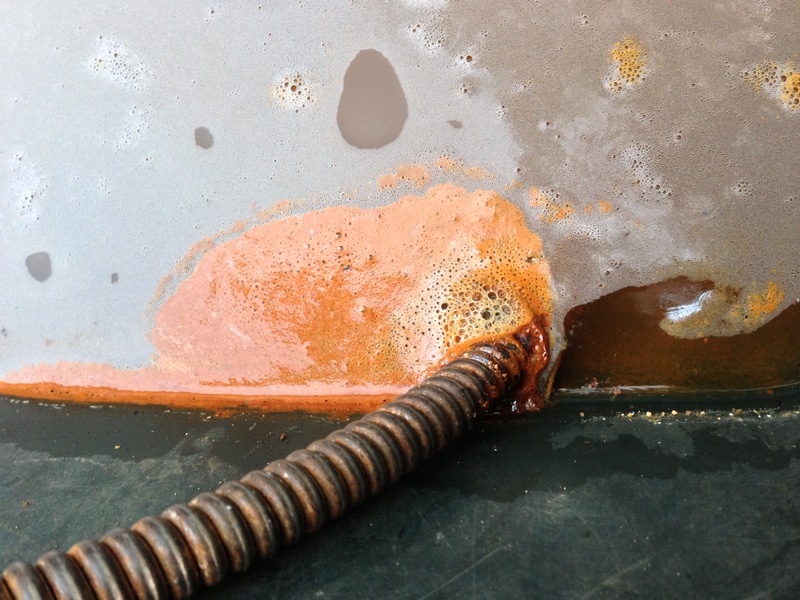 He was disappointed in the condition of the car, mainly because of the rust, but it also needed a carb rebuild. Then it started running very poorly and making a squeal when it did run. He let it sit for three years pondering just what to do while he was building his new house. 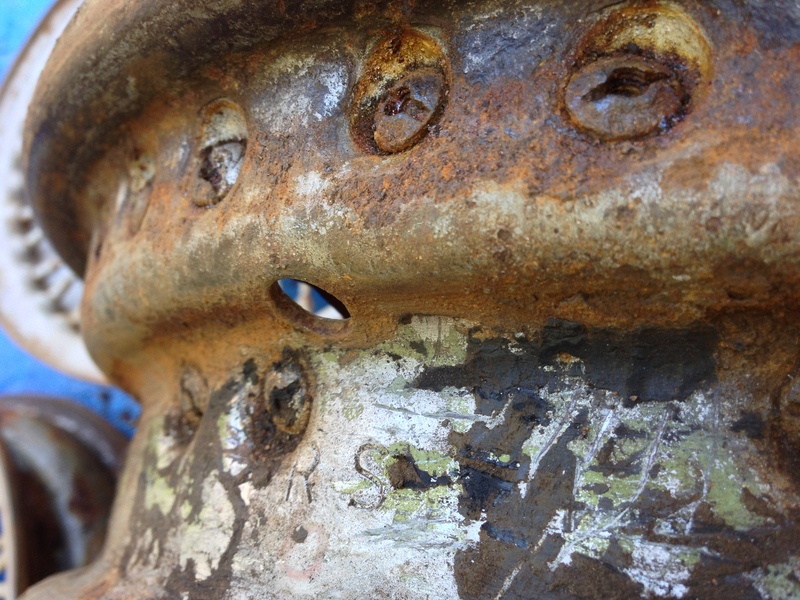 Unfortunately, it seems he left it out in the rain, letting the rust get worse. 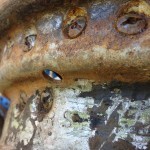 Fortunately, he lived Kula at 3000 feet above sea level and away from the salt air that would have made short work of the steel that was exposed. I have seen a video of a man with a 1973 E-9 in Honolulu that he was trying to restore. The amount of rust in that car is truly frightening. He was ready to give up at one point, but had put so much work in that he continued on for a while further. The there was no further update to the progress after he had most of the bodywork done, a few years ago. I’ll post a link to his blog in the links section. This car, while needing some welding to be back on the road, is nowhere near that bad. 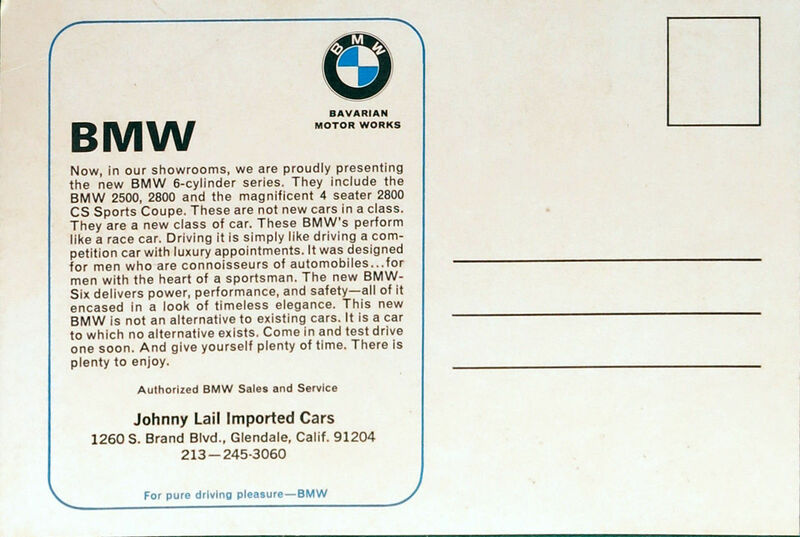 Some might consider it a donor for better cars, but I can’t afford a better car than this at the going rates for these. I have seen worse cars with asking prices of 3X what I paid for this. It is complete, down the the last tool in the tool kit and runs pretty well. It will live, I’ll make sure of that. I did have to pay for shipment from Maui to my new home in Austin TX, but I’m still ahead of the game. I’ll have an awesome car that will bring me many years of joy for less than an 8 year old ‘ordinary’ car. 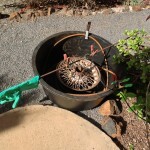 I’ve had a bit of a setback, the wheelbarrow has sprung a leak while working on the second wheel. 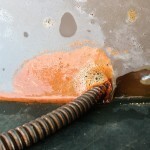 I drained it and scraped out the several cups of rust in the bottom. 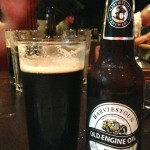 Searching for a suitable replacement took me to several places in town. 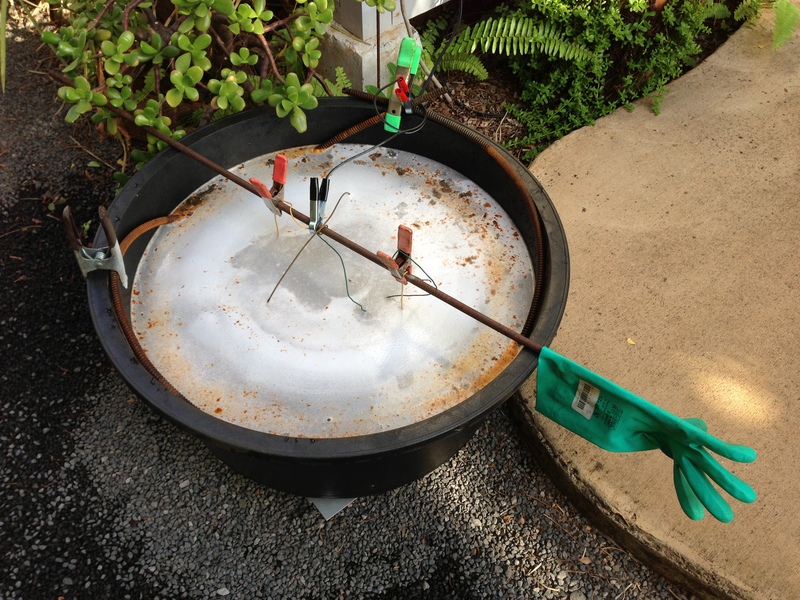 A 17 gallon bin from the discount store was not big enough to fit the wheel and clear the cable I’m using for the anode. I found a proper sized tub at the local farm supply store. 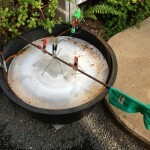 Twenty Five gallons in size and made of 100% recycled plastic for a modest $21. Yay. 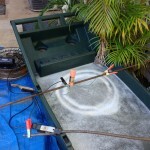 I set up the second wheel in the new bin and reconnected the battery charger. 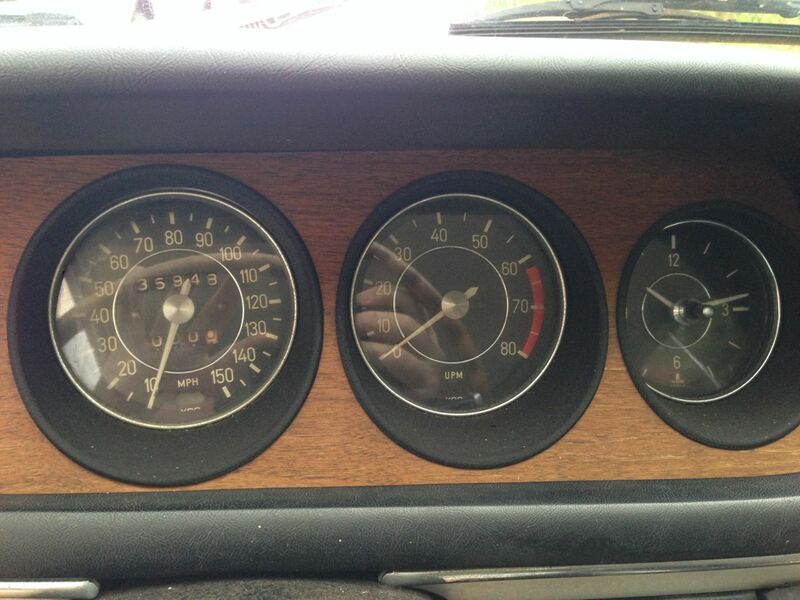 Unlike the first time when the ammeter showed a 6 amp draw, this time it only showed a 3 amp draw. Perhaps because I didn’t add as much of the OxyClean as before. Anyway, the process continued, although a bit more slowly. After leaving it in the bin overnight, I pulled the rim out and gave it a look. 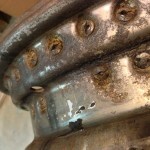 It was pretty clean considering the extent of the corrosion that was under the inner tube. 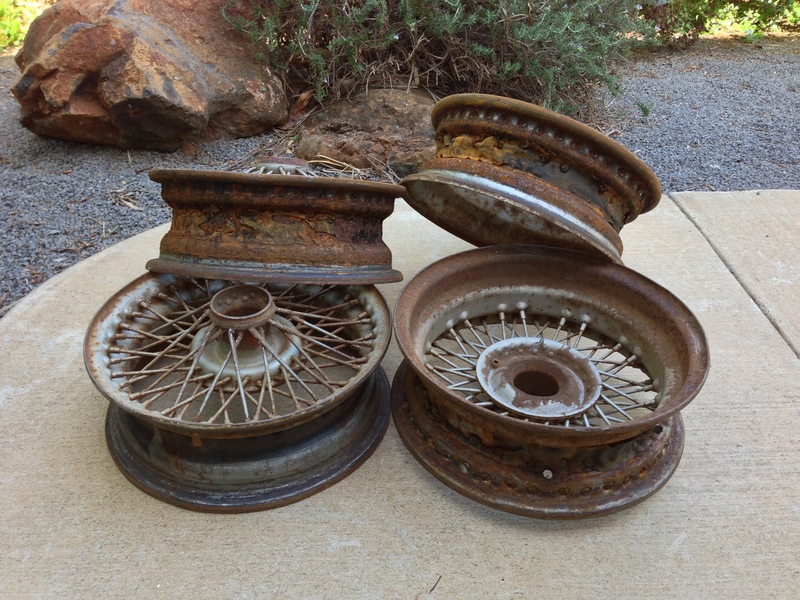 About 20% of the rim still had corrosion on it. 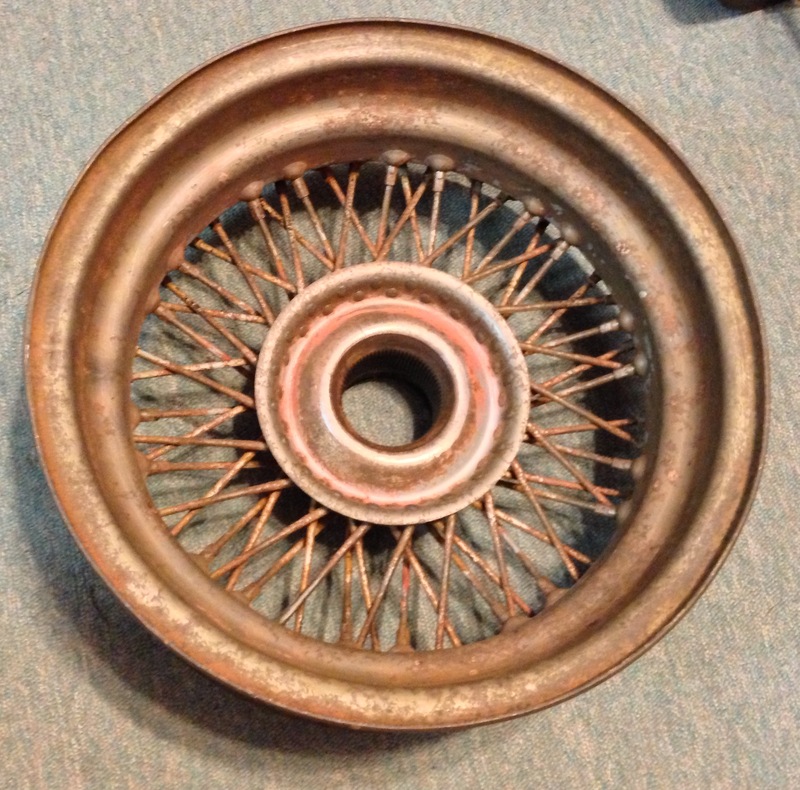 I scrubbed the rim with a wire brush and hosed off the grey iron oxide. 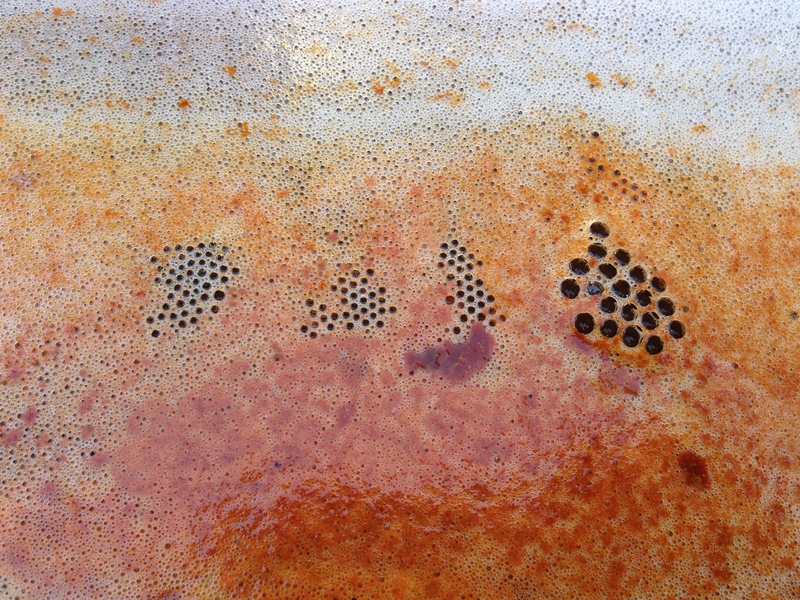 Not much of the red rust remained, but there was some left. Most of what remained had been turned into a black/grey form of iron oxide. 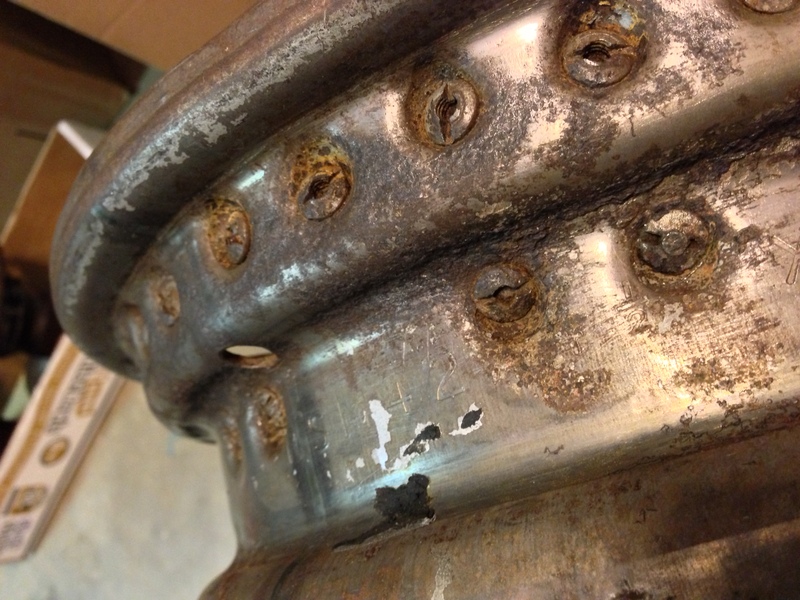 Some parts of the wheel looked as clean and bright as brand new, other parts show substantial surface pitting. Since I’ll be running inner tubes, I’m not so concerned about absolute perfection of the rim. I believe that it will be quite satisfactory. I’m not sure how much the power will cost to derust all my wheels, but at 38 cents per KwH, it’s not insignificant. Still, it won’t be a deal breaker. I’m thinking about paint options, what type of primer, what color to paint the wheels. I have a color scheme in mind, more on that later. 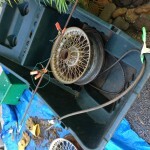 The new tub with wheel and water. 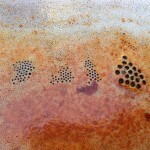 Starting to see some rust in the bubbles. 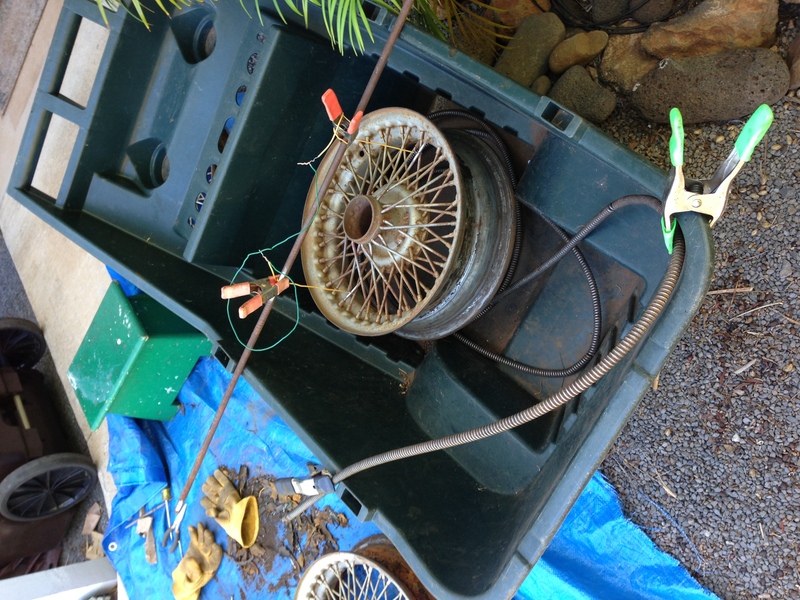 I let the wheel stay in the electrolysis wheelbarrow for several days. The bubbles continued and then gradually tapered off to nothing. The battery charger’s indicator showed little current flow. 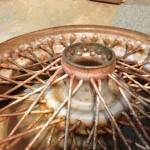 Examining the wheel showed that the majority of the paint had softened and a good deal of the rust was gone. 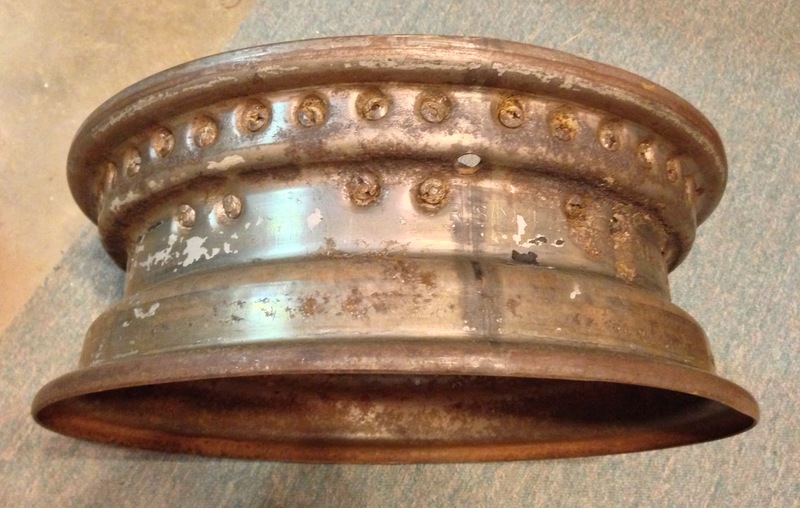 The side that was up did have more rust than the down side so I’ll flip the wheel over and give it another day or two in the bath. 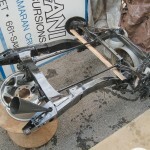 A majority of the paint washed off with a hose and a wire brush got a good deal of the rest. 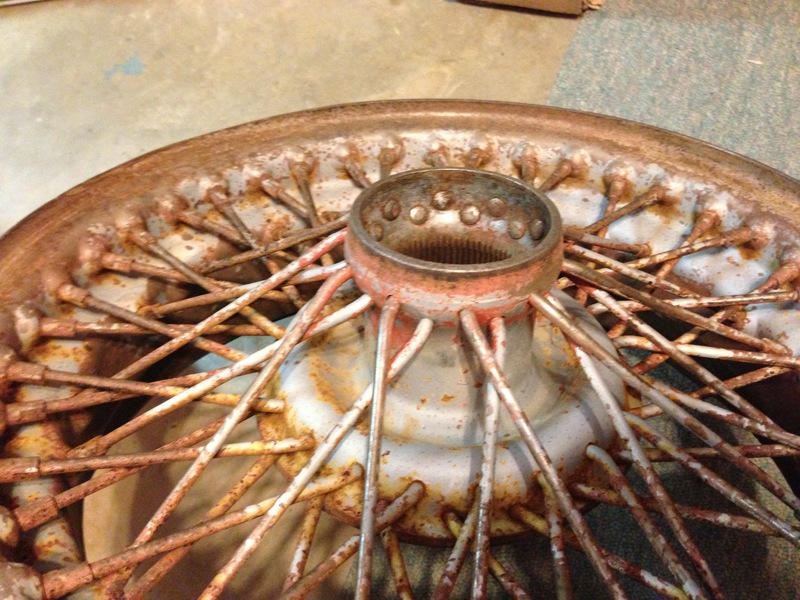 The rust was mostly gone in some spots and the wheel looks pretty good. If only I had more wheels as good as this one. I’ll finish this one and start on the next best wheel. Not a bad start. 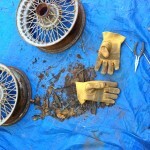 I’m trying to clean up the wire wheels I got last week so I can get them painted. 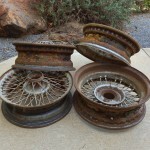 I had the tires dismounted and was sad to find that there was considerable rust inside the rims. 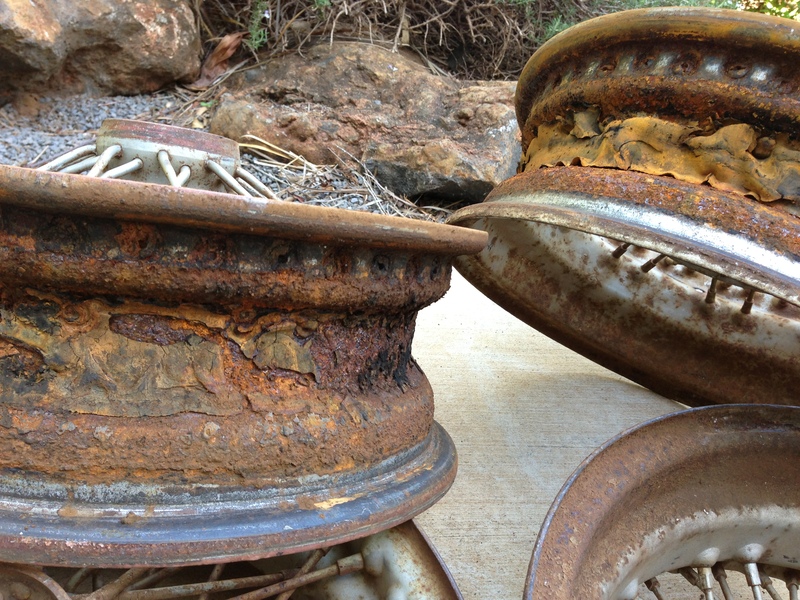 Tubeless tires make a good seal with the rim and keep out the environment, as long as there is air in them of course. 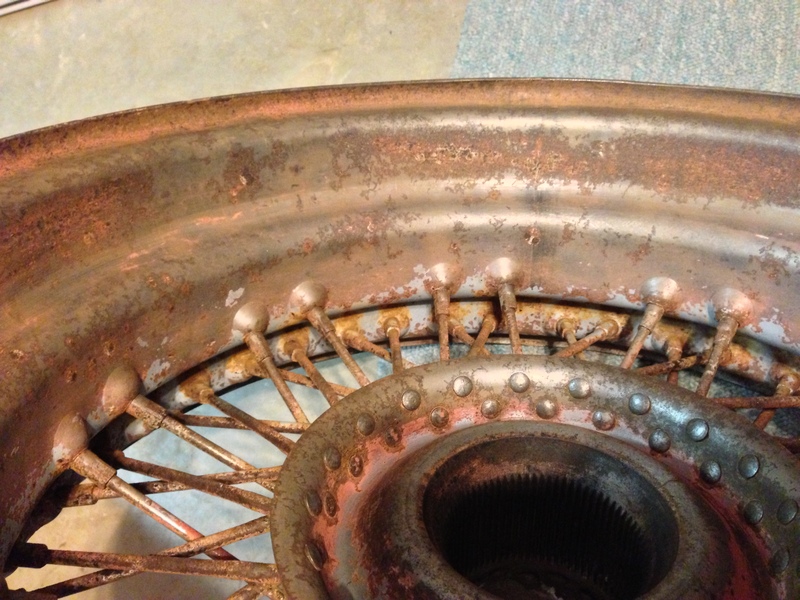 Wire wheels require tubes, and don’t always seal against the rim perfectly. 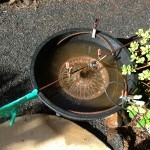 Water can also sneak in via the spokes. 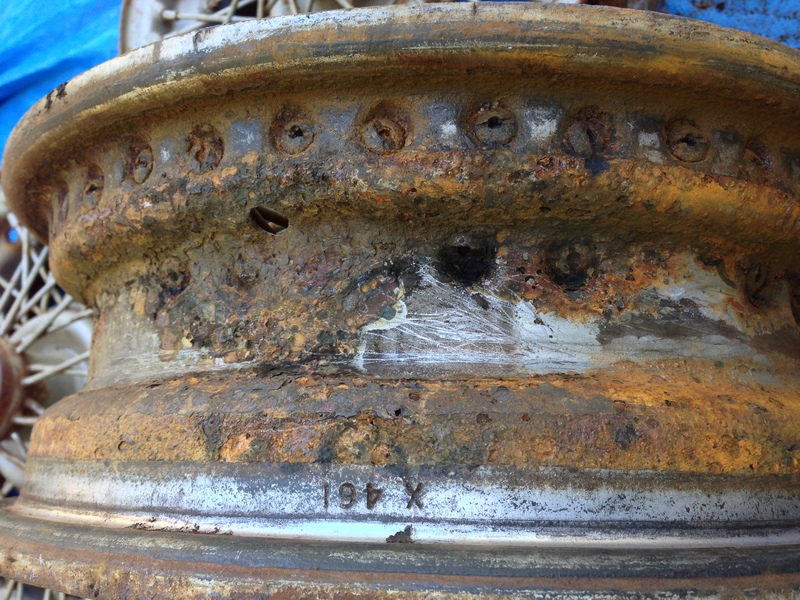 At least one of rims has substantial metal missing by the valve hole due to rust. It makes that one a backup spare only. I have one that is in really good shape, albeit I found it has a broken spoke. So I only need one more good one from the remaining five to get up and running. I was hoping to have two complete wheel sets, but that remains to be seen. 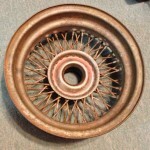 To clean up the rust, I initially figured I’d get the wheels sand blasted clean. I’m having a bit of trouble finding someone who can provide that service. If I do, I’m afraid it will cost more than what the wheels cost. I have already shelled out $72.50 to get 4 tires dismounted and discarded. Yes, services on the island cost more than on the mainland. So I try to do what I can myself. 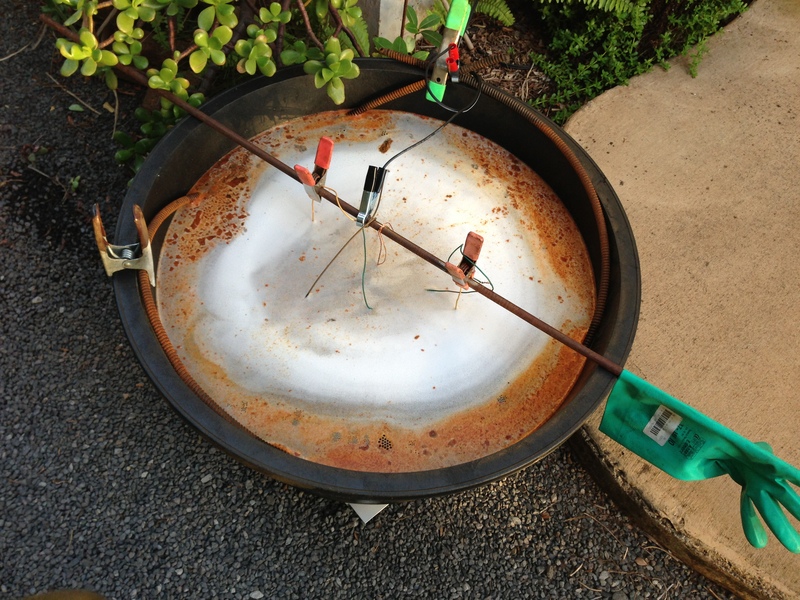 I found a video on YouTube that describes removing rust via electrolysis. There are a number of videos but the basics are the same. It looks easy enough and I have all the materials needed. 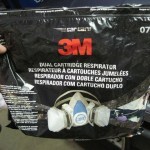 A big plastic container, a battery charger and sodium carbonate, aka OxyClean. Some electrical wire, wire brushes and sandpaper should be all I need. 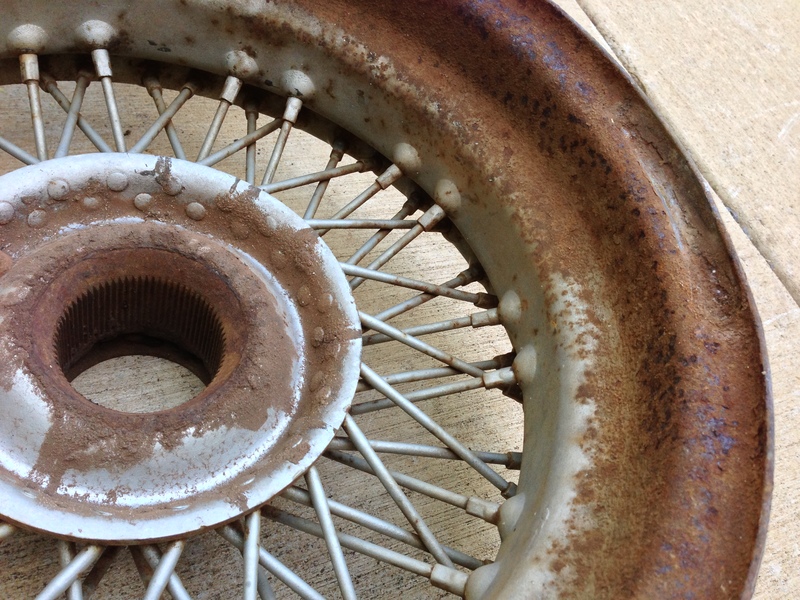 I removed the remaining rubber ring around the inner part of the wheel and the knocked off the largest rust bits. 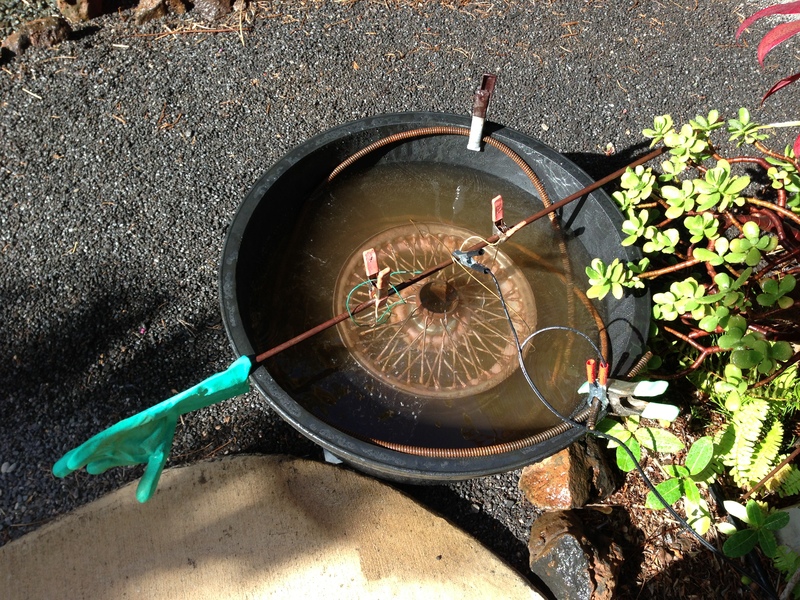 I suspended the wheel in the plastic wheelbarrow with the electrical wire and filled it with 25 gallons of water with the disolved OxyClean. 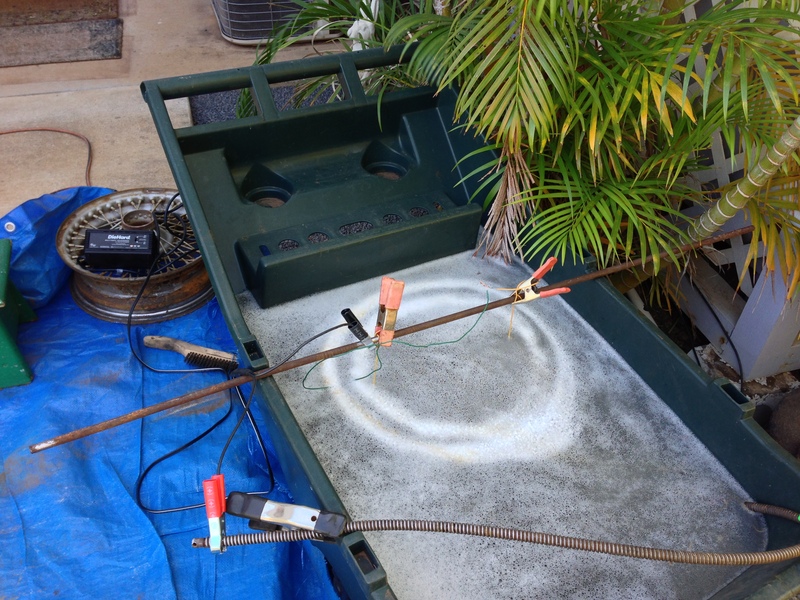 I had recently pulled a 15 foot length of plumber’s snake from the dumpster near work so I coiled that up in the bottom to act as the anode. One video mentions that the derusting action is more or less line of sight, so I think that means I’ll have to flip over the wheel to get the other side clean. 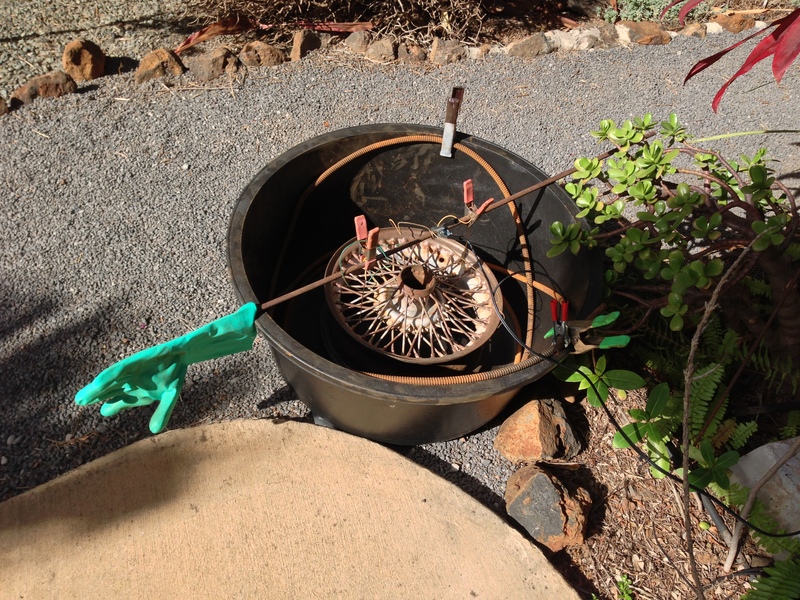 I may also have to loop the snake along the sides of the wheelbarrow to get the inner part of the rim clean, the part where the ends of the spokes are and the tire mates. I’ve had the current on for about an hour and am seeing some bubbles, so believe that I’m getting some action. I’ll probably have to leave it at least overnight since the battery charger is a maintenance type with an output of two amps. We’ll see how it looks tomorrow. 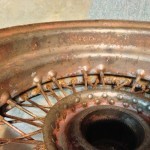 This is the back side of the best wheel. Looks like it will clean up pretty well. Dirty wheels in more than one way. These two are the worst of the four. I have two more I thought were worse than these on the outside, but who knows, they might be better on the inside. 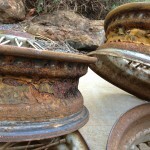 This is the least rusted wheel, lots of meat left here. 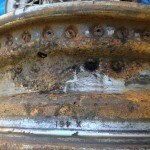 This wheel has lost a lot of steel around the valve hole, it would cut through a valve stem If I used it as is. 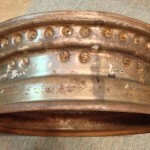 I could braze or weld in more material if I need to use this wheel. I hope I don’t. 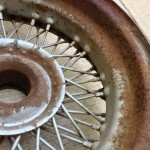 This is the loose rust from two wheels. Yuck. Bubbles rising in a ring from the wheel below. It’s working! 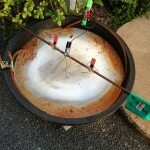 The first wheel is suspended above the cable serving as the anode.